While President Obama's golf weekend with Tiger Woods made national headlines in 2011, his friendly round of golf with Bill Clinton also caused quite a stir. According to NPR, "the two teed off on a cloudy afternoon at Andrews Air Force Base outside Washington and finished up just over four hours later." Although the White House declined to say how the outing came about or what the scores were, a joint statement from their spokesmen said "the presidents enjoyed it." And although their scores may remain Top Secret, what's not so secret is that many American presidents have been avid golfers. According to Don van Natta’s First Off the Tee: Presidential Hackers, Duffers, and Cheaters, 14 of the last 17 presidents have been serious golfers and "how they played the game revealed a lot about their character." Dwight Eisenhower, for example, reportedly played more than 800 times during his eight years in office and had a putting green installed on the south lawn of the White House. A member of Augusta National Golf Club, Ike broke 80 on a dozen occasions, according to van Natta, and the "Eisenhower Pine," located on the 17th hole, is named after him. Ike supposedly hit the tree so many times that, at a club meeting in 1956, he proposed that it be cut down. Not wanting to offend the president, the club’s chairman reportedly adjourned the meeting rather than reject the president's request. John F. Kennedy was also a serious golfer but he reportdly didn't want to be seen playing because he wanted to contrast his image with Eisenhower’ s reputation of “golfing his way through the presidency.” Kennedy and his aides reportedly “made a lot of hay out of Ike's constant playing, and called him the ‘Duffer in Chief.’” But they tried to keep [JFK's] game secret. 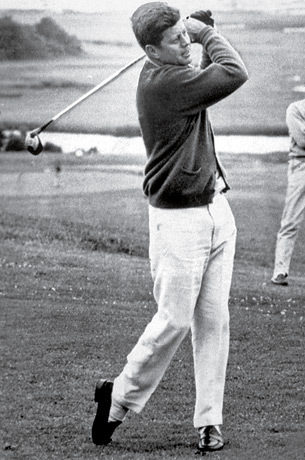 In fact, Americans didn't really know that JFK loved golf until several months after he was in office. The reason they let the cat out of the bag, according to van Natta, was because of rumors about JFK’s other “extracurricular activities.” Pierre Salinger, JFK’s press secretary, had to say, "No, no, no. He's playing golf,” which was a lot better than the alternative. As for Lyndon Johnson, van Natta says that he “really tore it up” on the golf course and “would take 300, sometimes 400 swings, to get around an 18-hole golf course...He just wanted the feel of one perfect shot, and if it took 400 swings to do it, he was going to do it. He was the president and nobody was going to get in his way." While Ronald Reagan only played the game about a dozen times while in office, he loved to putt around as evidenced by photographs of him putting in the Oval Office and on Air Force One. But nowhere does golf run deeper than in the Bush family bloodline. As for Clinton, Van Natta, who played golf with the former president a few summers ago, said that Clinton "followed the rules for about a hole and a half. Then he...started taking these do-over shots, gimme putts and, at the end of the 18 holes, it took him about 200 swings to score an 82." And as for Obama, an article in Time magazine notes that he took up golf “as a relaxing alternative to basketball...but now that his game is out of the closet, it is clear that he duffs in much the same way that he tries to govern.” Wellington Wilson, Obama’s longtime golf buddy, was quoted in the article as saying, “You can really tell a person's personality by the way he plays golf. He just goes with the flow. Not too high. Not too low." While it's hard to know if Obama "just went with the flow" on the course with Bill Clinton, we do know that he attended a Black Caucus Dinner in Washington D.C. later in the evening, then flew to the West Coast where he pitched his Buffett Rule plan to tax millionaires to some A-List celebrities on Monday night during a fundraiser at the upscale Fig and Olive restaurant in West Hollywood. Fig & Olive's PR company remains tight-lipped about [Monday] night's fare, and the restaurant's employees are under strict confidentiality agreements. But this afternoon, we spoke to a guest who was more than happy to spill the beans, and reveal the $17,900 Obama dinner's secret ingredients. According to the guest, the dinner had no printed menu, but the appetizer options included jamón ibérico and a fig Gorgonzola tartlet, while the entree options included: striped bass filet en papillote with zucchini, eggplant, fennel, tomato, thyme, scallion, and saffron, and served with Arbequina olive oil mashed potato & chives; free range organic chicken breast with grilled zucchini, eggplant, heirloom tomato, cipollini onion, roasted fig, Parmesan polenta, and marinated red bell pepper; and rosemary lamb chops, grilled then smoked a la minute with Herbs de Provence, goat cheese, and chive gnocchi. Mix first 6 ingredients in small bowl. Place lamb chops in single layer in 13x9x2-inch glass dish. Pour marinade over. cover with foil and refrigerate 4 hours, turning lamb chops occasionally. Prepare barbecue (medium-high heat). When coals turn white, drain chips, if using, and scatter over coals. When chips begin to smoke, season lamb with salt and pepper and place on grill. Cover; grill shops to desired doneness, basting often with marinade, about 4 minutes per side for medium-rare. Transfer to platter and serve.